“Rustic” is such a handy word when it comes to describing food. My homemade sourdough baguettes are always “rustic” which means I’m sloppy about shaping the loaves, and when my pastry doesn’t turn out as perfectly as it could, all is well if the word “rustic” is added to its title. However, there are times when “rustic” isn’t a euphemism for messy. Sometimes, a thing is “rustic” because it’s simple, charming, or well-textured. This almond cake is that kind of rustic. When I saw it in the June issue of Food and Wine, it went directly into my to-try stack of recipes. I have a not-so-successful history with almond cakes, so I headed into this recipe with a little concern. In the past, almond cakes I’ve made have been dense, dry, and dull. Thankfully, there were a few tricks to making this cake that prevented all of that. The cake batter is made with polenta and minced rosemary which added interest in both the flavor and texture departments. Also, the eggs were whipped with sugar to a fluffy state, and folding the mixture into the dry ingredients lightened the batter. One last trick was the use of a sugar and lemon syrup that was poured over the warm cake and prevented it from becoming dry. Let me run through the details and the minor changes I made the original recipe. Skin-on, raw almonds were toasted, chopped, and ground in a food processor. I added some of the sugar to the almonds in the food processor to prevent them from forming a paste. The dry ingredients were combined, and I always sieve dry ingredients. I used whole wheat pastry flour instead of all-purpose, and polenta, baking powder, and salt were also included. After sieving those, I added the ground almonds, minced rosemary, and lemon zest. In a stand mixer, the eggs were mixed with the remaining sugar using the whisk attachment for about ten minutes until tripled in volume. Then, creme fraiche and cooled, melted butter were added. 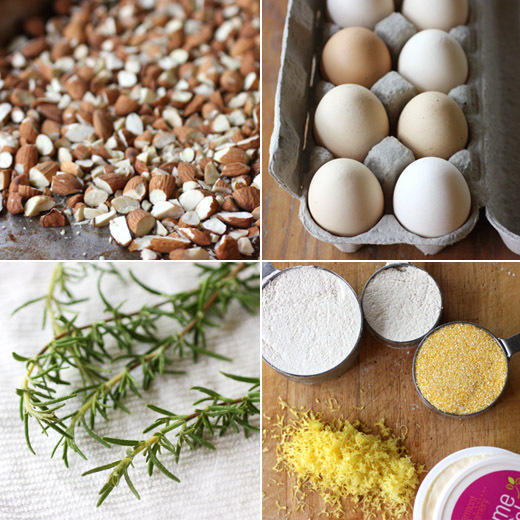 The egg mixture was folded into the dry ingredients in three additions. For baking, an eleven-inch springform pan is suggested, but I used a ten-inch pan. The cake baked for 25 minutes while the syrup was made. Sugar, water, and lemon juice were boiled and reduced for five minutes, and then I added a sprig of rosemary to steep in the syrup as it cooled. When the hot cake was removed from the oven, the syrup, minus the rosemary sprig, was poured over the top, and it was left to cool completely. Once cool, it was glazed with a mix of confectioners’ sugar, creme fraiche, and lemon juice and topped with pieces of rosemary. I finally got over my losing streak with almond cakes. This is in no way light and fluffy like a chiffon, but it definitely wasn’t as dense as other almond cakes I’ve attempted. The sugar syrup worked like a charm in warding off a dry texture too. Next time, I might add a bit more minced rosemary to the batter since its flavor was very subtle, and those extra flecks of green will just make the cake even more “rustic” in a very good way. A delightful combination of flavors! So Italian... Your cake is very tempting. I adore the combo of almonds and rosemary...the cake looks elegantly rustic and delectable. Such a unique cake - the creme fraiche glaze is just beautiful! What a beautiful cake . . . as we say around this Italian home, "Che Bella"! This is a keeper for me! Thanks for sharing Lisa! Gorgeous! I often made a almond&mandarin cake, but somehow forgot about it. That is, until now! Love the glaze on top, gotta do that next time too! Just my kind of cake, not too fussy but sparkling with flavor and impressive when serving! Beautiful! I love almond cakes but have run into some of the issues you describe as well. I'm thinking whipping the eggs was the saving grace? I would have thought the polenta and whole wheat flour might have made it heavy so whatever the trick, glad to hear it worked! I love the look of the cake with the rosemary sprinkled on the top. So elegant. And what a scrumptious combination of flavors! I love almonds. I like them even more in cakes, because it gives the cake a distinctive flavor. However, I have never added rosemary to a cake and I will try this the next time I bake. Love the flavors you're rocking here! Such a great combo, and the cake itself looks nice nice. Very good stuff - thank you. I'm a huge fan of cake with almonds...yum. I saw this recipe and was intrigued as well. Since there is an abundance of rosemary in the garden I am tempted to try this recipe. I like the modifications you made to the recipe. I think you should become a recipe tester for F&W. wow, this looks incredible! it looks seriously delicious, and is definitely going on my must-bake list! 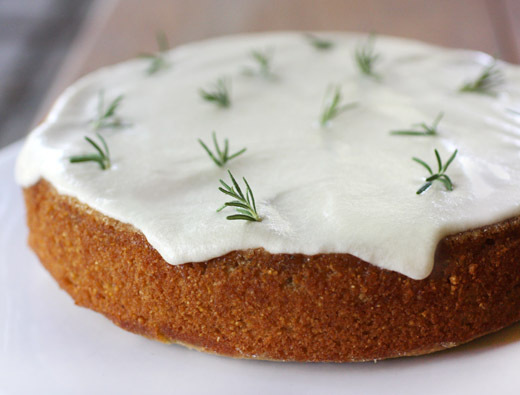 I've never thought to use rosemary in cakes. Got a rosemary bush in my garden, might give this a go! love how you decorated the cake, so pretty! Wow that looks like a lovely cake ~ YUM Never really cooked baked with rosemary hehe :) Great idea! We maintain that there's nothing wrong with rustic, regardless of the definition we use. All of our baked goods have a rustic flair. :) You did an excellent job making this cake look as gorgeous as anything. A slice would be nice right now! This cake is beautiful. 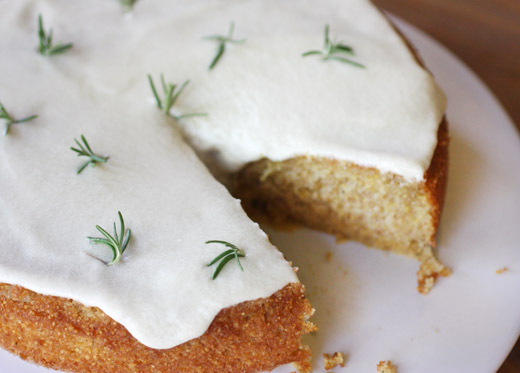 I absolutely love herbs in baked sweets, so I know I'd love this cake. Very nice! Your cake is so pretty! Love the little rosemary sprigs.